Greetings! 2012 is already well underway, and I hope you are all making the most of it! In the past year, I’ve been very busy and blessed with my photography business Wildernesscapes Photography LLC! As I’m typing this, I’m sitting in a train station in Kiruna, Sweden, waiting around since the train north out of here can’t run because it was too cold for it at -40 C (- 40 F as well) last night. Later today I’m starting a 7 day ski tour hut-to-hut along the famous Kungsleden trail through Swedish Lappland. The hut-to-hut ski touring season really starts around the end of February, when the temperatures start to warm up a bit, so I have a tough task ahead of me if the temperatures stay around minus -25-30 Celsius during the days, with about 5 hours of daylight. I’m hoping to continue photographing the aurora borealis (northern lights) on this trip, along with wilderness ski touring imagery, for submitting to stock agencies I’m now a contributor to, including Getty Images and Aurora Photos. Stock photography is a small part of my business, but I’m conscientiously building my stock portfolios, one reason I am up here in Kiruna in the first place. The other reason is that I’ve fulfilled a long-time interest of mine to go dog-sledding on a longer trip – not the ½ day touristy sort where you ride in the sled, but a real 8 day dog-sledding expedition where we each have our own dog team to mush and take care of. I went on this dog-sledding trip with Stefan Blawath, a German client and now friend from an Iceland photography workshop I led, and we both had similar goals of photographing the dog-sledding and the aurora borealis on a trip like this. We chose Kiruna, Sweden, because this area is famous for its position above the arctic circle and directly in the central part of the auroral oval (the ring shaped area encircling the earth’s magnetic pole where the aurora phenomenon is most active). We were abundantly blessed with clear weather, a patient guide who would go back and forth with the dogsled team posing for our cameras, and very strong aurora borealis on 3 nights. In fact, on January 23-24 during our trip, the strongest coronal mass ejection from the sun in the past 7 years occurred, resulting in some fantastic auroras that we photographed. I stayed out from 6pm till 3am in minus-36 degree Celsius temperatures photographing, but of course it was worth it. At times, the curtain of light overhead changes patterns and shape so quickly that I just couldn’t photograph it (I need at least a 4 second shutter speed with my current setup to get the right exposure), and instead I just laid back in the snow and watched it with awe and praise to God. Each day we dog-sledded 25-45 km through forests and across frozen lakes. The dogs love to run – in fact, as soon as we brought out the dog harnesses , the dogs started barking happily, but when we’ve harnessed all 6 dogs to the sled and lift our snow anchor that’s holding the sled back, the incessant barking instantly ceases and is replaced by the quiet swoosh of the snow under the dogsled and the creaking of it’s wooden framework. We stayed in cozy wilderness cabins which even had Swedish saunas to relax in (though the shock from +80 degrees C to -35 C is something to write about). Before dog-sledding in Kiruna, I started out the year 2012 in Iceland photographing inside blue glacial ice caves with Icelandic photographer and my co-leader on summer trips we led, Örvar Þorgeirsson, Then I led an Icelandic Winter Landscape and Northern Lights photography 7-day tour with 4 clients from England and the USA, and we experienced whiteout blizzards, roads that create a new definition for ‘icy roads’ with a 2 inch thick layer of ice that’s neither sanded nor salted, and yes, some amazing sunrises and winter sunlight shining through clear icebergs. We did an ambitious itinerary visiting all the sights of the Golden Circle, the south coast, the Skaftafell and Jökulsarlon glacial areas, and the Eastfjords all the way out to Djupivogur. 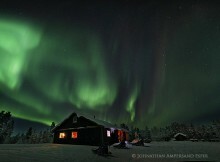 and in the evenings and nights we photographed the aurora borealis when it decided to show itself. 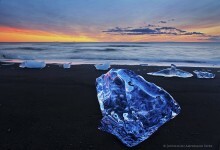 Fortunately, we did see the aurora borealis on 2 nights, including over the iceberg-filled lagoon of Jökulsarlon. Also, in Iceland before the workshop, I rolled and totaled a car for the 2nd time in Iceland. The first time was back in 2009 when a brand new Jeep that I was importing into the country was in a shipping container that toppled over, and this time, I was travelling for a week before the start of my tour with a friend I met back when climbing Kilimanjaro in Africa in March 2011. We drove through a snowdrift across the road and came out of it a little crooked. On the other side of the snow drift was that 2 inch thick layer of ice on the road, and well, after his counter-steering failed to correct our skid, we went off the road going sideways at around 50 kmph and rolled twice. We were both unhurt thanks to our seatbelts and me cradling my arms around my head to protect myself. The police are the friendliest bunch I’ve seen anywhere, didn’t give us any tickets such as the dreaded ‘failure to keep right’ we certainly would have earned in the United States, and even drove us to another town to a guesthouse. So, my Iceland tour clients a few days later got to ride in a brand new, rented Toyota Landcruiser with so many features that I was randomly pushing every button I could find to no avail trying to perform simple tasks like opening the gas cap (I’m a pessimist when it comes to features and technology – instead of saying ‘what nice, comfortable features in this vehicle”, I say “more electronic things that will break!”) Come summer 2012, I’ll probably have to buy a new vehicle in Iceland for my trips then. The full trip description of this exciting tour is on my website, here. That’s about it for 2012 so far, but lot’s more is planned for this year, including Lofoten Norway, Adirondack Park USA photography, publishing a photography book on the Adirondacks, Iceland workshops, and New Zealand and Tasmania trekking, back to where I first began my photography career in 2006! But first, I’m grateful to God for a busy year in 2011, with more fine-art photo sales than in all previous years combined! 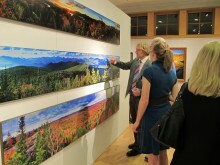 363 photos are being enjoyed as art in 280 homes and business around the Adirondacks and the world! I lived for a few months early on in 2011 out in Boulder, Colorado doing some backcountry skiing, canyoneering, and unfortunately just generally not getting as much photo editing and other related projects done that I had planned to! That’s the way it always seems – I am casually looking for a part time photo-editor + media-preparation assistant on a student-level wage (for my stock imagery; I'll still always edit my own fine-art images! ), so I would welcome applications if you’re interested. I also did successfully summit Kilimanjaro, the highest mountain in Africa, in March of 2011, after waiting 19 years to go back to that mountain for a 2nd try, on a one week guided climbing expedition with my Aconcagua climbing partner Jason Maehl. Full photos are on Flickr, here. Oh yes, we also went on a week safari, seeing lots of elephants, rhinos, lions, and leopards! Then in the summer of 2011, I led along with Icelandic photographer Örvar Þorgeirsson of Arctic Photo, 18 clients from all over North America, Europe, and even Africa, on two 12-day photography workshops in Iceland, in a comprehensive itinerary circumnavigating Iceland that included four days of highland region 4x4 driving as well as stops at all the popular natural attractions around the perimeter of Iceland. (full trip description here). Working with Örvar was a real pleasure – he’s the best photographer in Iceland in my opinion; he’s patient, a great teacher and leader, and has great photographic vision also. This was a true career milestone for me, leading an international photography trip, and I plan to lead many more of these types of trips in the future. I love sharing my local knowledge of exotic places, and helping others to appreciate nature better themselves through the lens of their camera. I also enjoy organizing and leading the trips themselves – I never have been much of a group traveler myself, but leading one is very different. I again plan on collaborating with Örvar Þorgeirsson as a special guest photographer for 2 tours around Iceland again in the summer of 2012. My late July trip has a similar itininerary to last summer's popular trips, completely encircling Iceland, and the August trip features a brand new itinerary exploring the Westfjords and Highlands regions, two of my favorite areas in Iceland that are bypassed by many travelers. On this trip, we'll take a charter boat out to the Hornstrandir Peninsula, known as the best wilderness hiking in Iceland with amazing sea cliffs and friendly arctic foxes, and explore the Landmannalauger, Langisjor, and Kjölur Highlands areas by 4x4 vehicle for a week! So, a very busy and productive summer in Iceland was followed by a busy late summer and fall season of going to art/craft shows and being a vendor around the Adirondack Park region where I am from and specialize in photographically. I vendored at 21 shows this year, every weekend from August until December, with each show being 1-2 days. Displaying and selling my photography was very rewarding and a great way to further establish myself as a strong regional photographer of the Adirondack region. A significant portion of my photography sales come from these shows, and many more people are now familiar with my name just by passing my tent booth. Selling artwork at shows is not for everyone - sometimes doing shows can get very monotonous and tiring – I’m actually always the slowest vendor to take down my booth at every show (up to 4 hours take-down time), because I have to wrap each photographic piece in foam wrap individually first, and also answering common questions like “what camera do you use?” can get very monotonous. Also exhibiting at these shows requires a huge financial commitment for inventory to display (I actually drove a truckload of around 250 peices across the country from my Colorado-based mounting company that I use back to the Adirondack region once this year), and inventory complicates life too. I think this saying is quite apt, “Inventory is like loose coins, you try to get rid of them, but the moment you do, you’re obliged to acquire more!” But, I think the effort is worth it, at least for me and my business strategy. And the help from family at some shows is a huge relief too! In the summer of 2012, I will again be a vendor at some of my favorite regional shows and will post my show schedule on my website in due course. (Show schedule is posted on my website here). It’s always an honor to meet people at my shows that came specifically to see my work, or meet prior customers that come back again, so if you read this newsletter and see me at a show, introduce yourself once more! I am pleased that my photography work interests you all in some way or another, and I hope to continue creating new compelling work and stories for you in the future! I also have more photos on the Flickr website, if you want to browse , and many new Adirondack region photos in my 'Adirondack Park II' gallery on my website. Finally, I am honored to be currently exhibiting alongside all the 'greats' of Adirondack photography (like Nathan Farb, Carl Heilmann II, etc), in a large photography exhibition called “Adirondack Viewfinders”, hosted by the View Arts Center of Old Forge, NY. 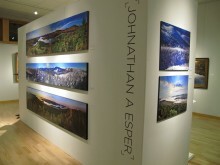 The exhibition goes from December 3, 2011 to March 3, 2012, so you still have time to stop by and view this amazing display of Adirondack photography spanning multiple professional photographers all in one exhibition! Have a great winter/spring!